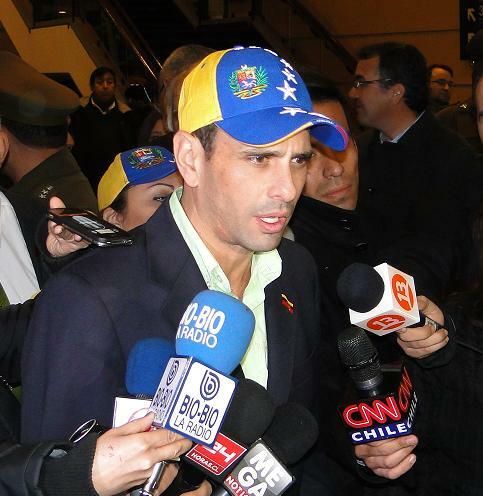 As some of you know, Henrique Capriles was in Chile last week as part of a tour that took him to Peru. (My take in Prodavinci here, and my analysis over at Foreign Policy’s Transitions blog – including a reference to Melanie Griffith that came totally out of left field – here). I had never met Capriles before, and had only seen him in person once, a long time ago, during a speech he gave to Primero Justicia. The first thing that struck me about him is that, indeed, he is “el Flaco.” He is surprisingly thin, almost painfully so. His facial features – the beady eyes, the angular face – pop out at you in a way that TV does not do justice. The guy really needs to eat a cheeseburger. He is also remarkably deliberate in his gait and in his stare. His body language is slow, methodical, precise, economical almost. I don’t know what that means, but it’s something that popped out at me. Capriles did great here. Even though he was swarmed with media, opportunist politicians, and even bloggers (!) he never lost his composure. He was exhausted from the long trip, but he was always personable, right on message, remarkably even-keeled. His manner was professional and optimistic, even in the face of the controversies that surrounded his visit. This was evident in the speech he gave the Venezuelan expat community. He made his case clearly, and for the first time I got a sense that he knows where this is going, or at least where he wants to take this. Capriles is by no means perfect. From what I personally witnessed, I have serious doubts about his ability to pick the right people for specific jobs (let’s just say that, when I posted this, I fell far short). I also feel like he could have been a bit more forceful and less congenial on some of the things he said. But overall, it was fun to see this guy up close. I was exhausted after two days of working on his tour, but I left proud of having voted for him twice.